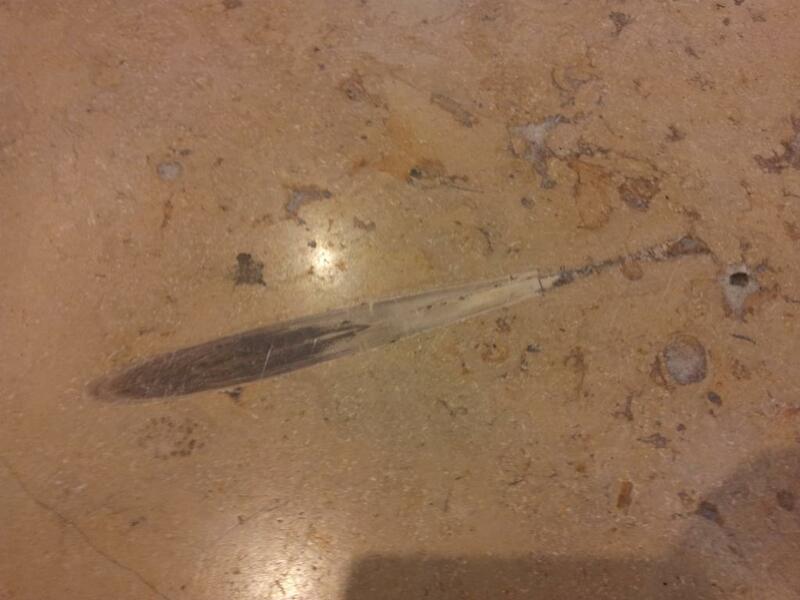 I found these fossils on the marble pylons at the railway station. Please, what are they? Thanks for answer. They look like cross sections of Orthocone cephalopods. Hello, and a very warm welcome to TFF from Morocco. 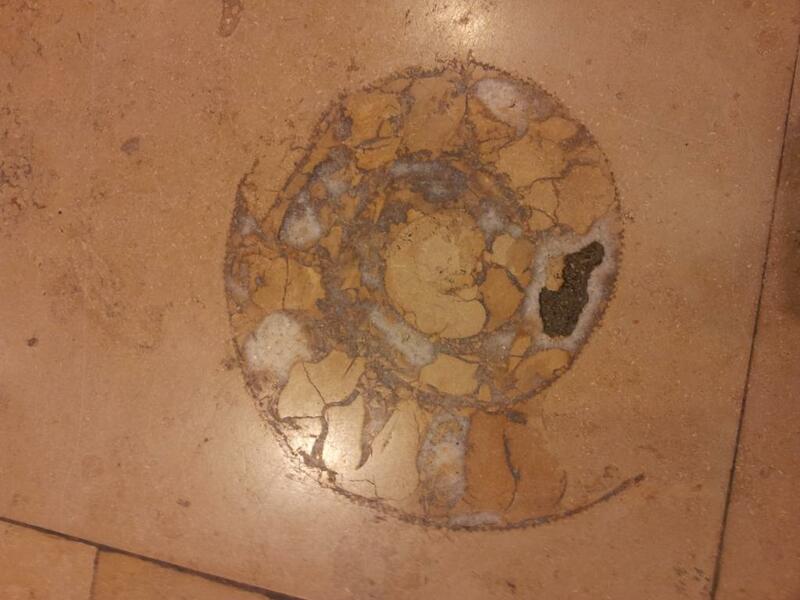 Look like nautiloids to me as well.
" In addition to abundant Saccocoma and variable contents of Globochaete and Bositra, the samples contained also radiolarians, ostracods, crinoids, foraminifers such as Globuligerina, Nodosaria, Involutina, Spirilina, recrystallised bivalves, brachiopods, aptychi and calcareous dinoflagellates Colomisphaera minutissima, C. carpathica, C. lapidosa, C. fibrata, C. nagyi, C. pulla, Carpistomiosphaera borzai, Ca. 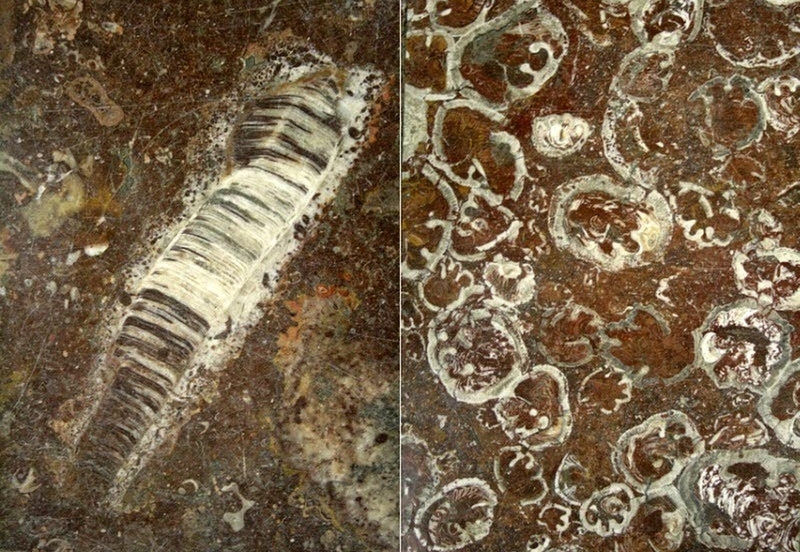 tithonica, Cadosinaparvula and Stomiosphaera moluccana. 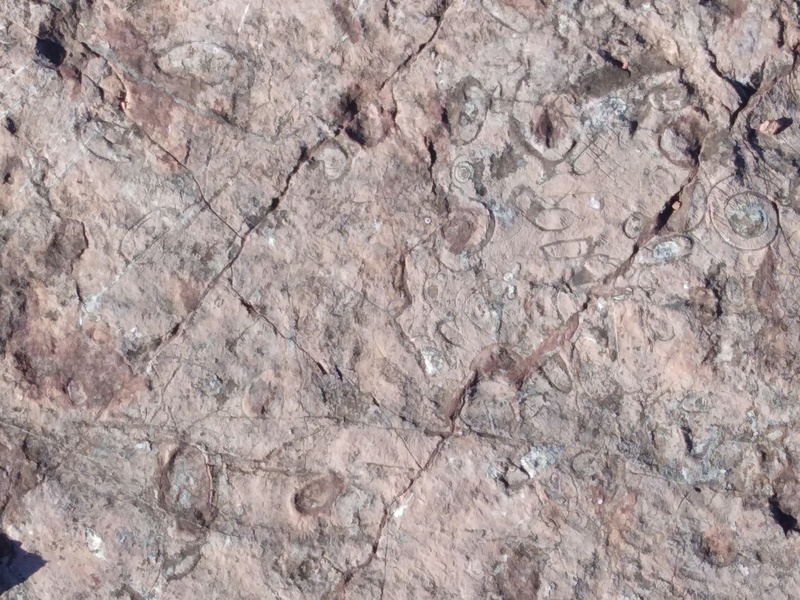 According to microfacies and dinoflagellates (Reháková, 2000; Reháková et al., 2011), the rocks of the samples are of Oxfordian, Kimmeridgian and Tithonian ages. Abundant compressed aggregates of iron (III) oxide-hydroxide, clay minerals and ±quartz were found between the nodules. Occasionally, calcite veins were present. " I'm pretty sure this one is a high spired gastropod. I'll go along with Al Dente. 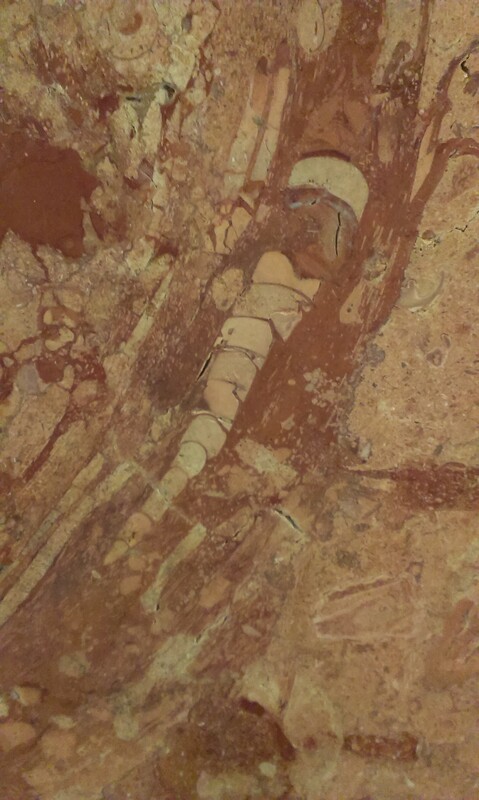 If those pillars are Jurassic limestone/marble, then that would rule out orthocone nautiloids. I'd be inclined to agree, if we had any reliable location information, or scale of the fossils. 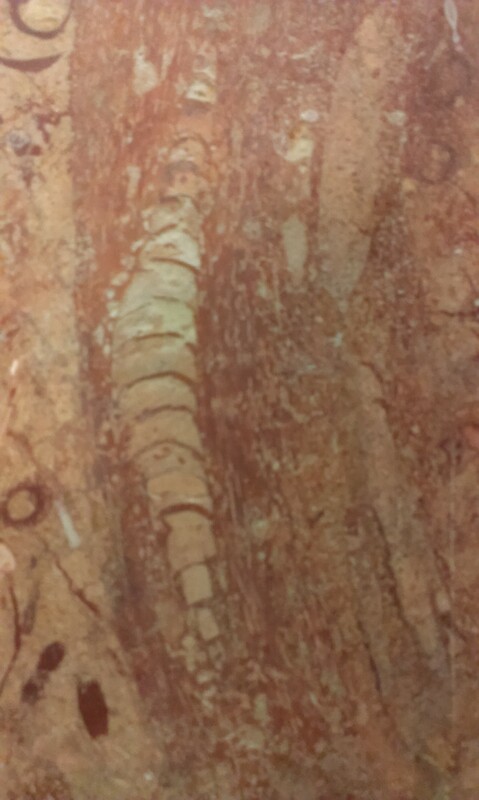 the length of fossil at first picture is app 5 cm, second and third picture app 10-15 cm. I am in the cephalopod camp on these. I can see no evidence of the spiral core of a gastropod shell in these pieces. Well, it could be an orthocone or a Nerinae as said Caterpillar, but i think it will be hard to tell more. I won't choose a camp on this one. And a warm welcome on from France. Now we have approximate dimensions, but we don't know the provenance of the red marble. What is sure, is that the geological age is Jurassic (Lias - Malm) in any cases, even if it was imported from the adjacent countries (Austria, Poland, Hungary, Romania, or Italy) and was not quarried in Slovakia. This document may reveal more insides of the "red marble", I think. Just FYI: The stone industry and geologists use different terms for rock types. Most in the stone industry are marketable names and often, unfortunately, crookedly overlap, the geology terms. 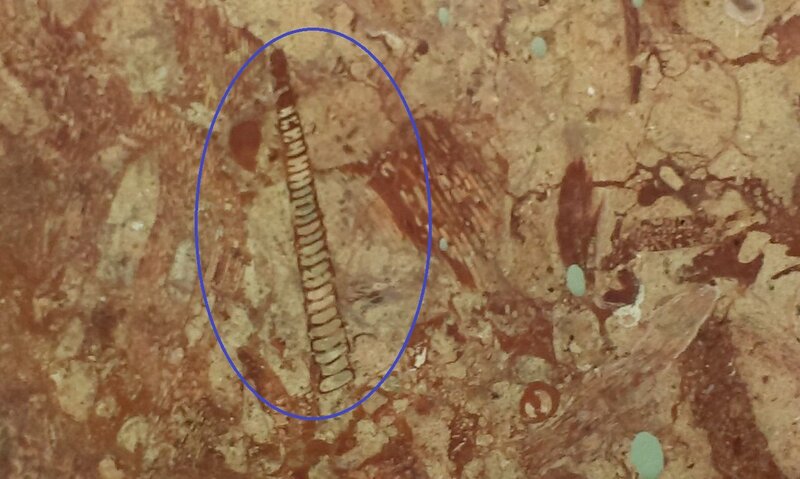 If is has fossils in it it almost can't be a marble, which is metamorphosed to the point of usually destroying any contained fossils. 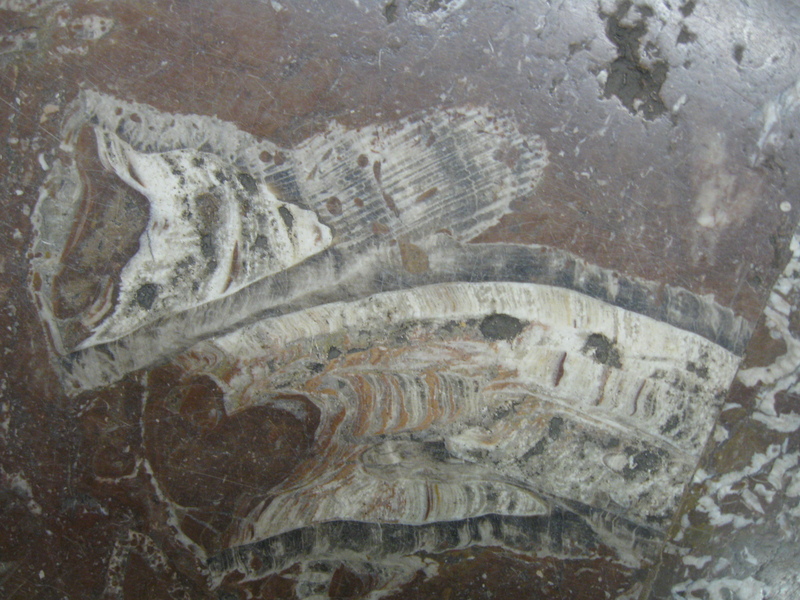 Most shell-packed commercial stones are limestones. 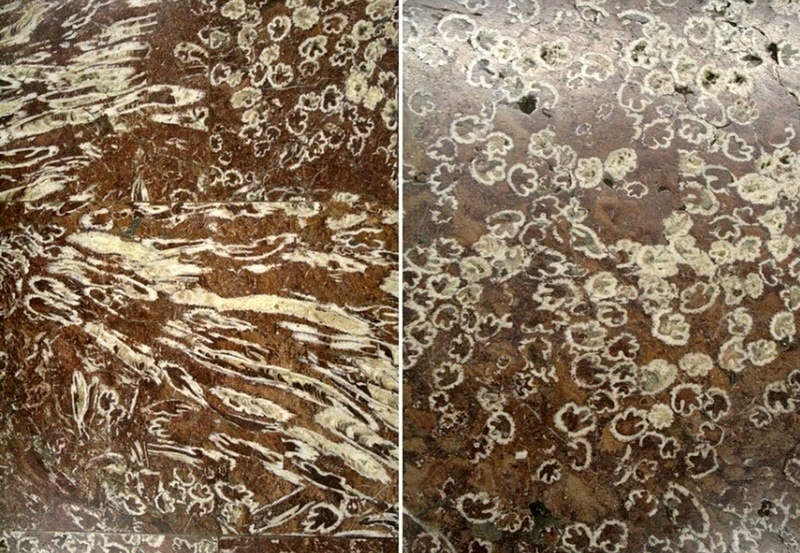 Here are some images of fossiliferous "red marble" (nodular red limestone) plates from the metro station Politehnica, Bucarest, Romania. @FranzBernhard The first two photos (and others) look like rudists. What do you think? 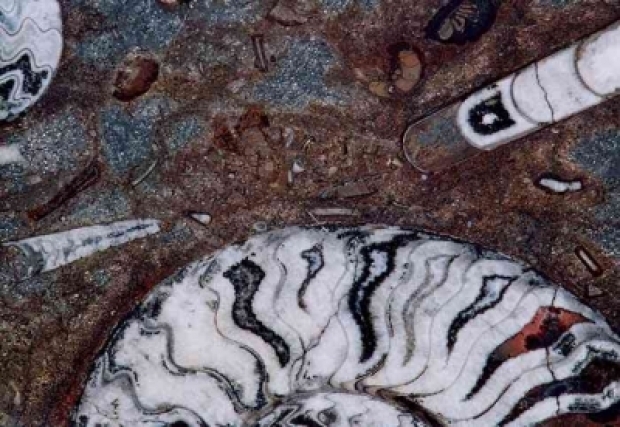 @DPS Ammonite, thanks for tagging, I would have missed this very, very nice rocks! Yes, @abyssunder presented many rudist rocks, mostly with hippuritids. Very nice! Someone knowledgeable could even give proper names to it, they are very nicely preseved. The stone industry and geologists use different terms for rock types. Oh yes! 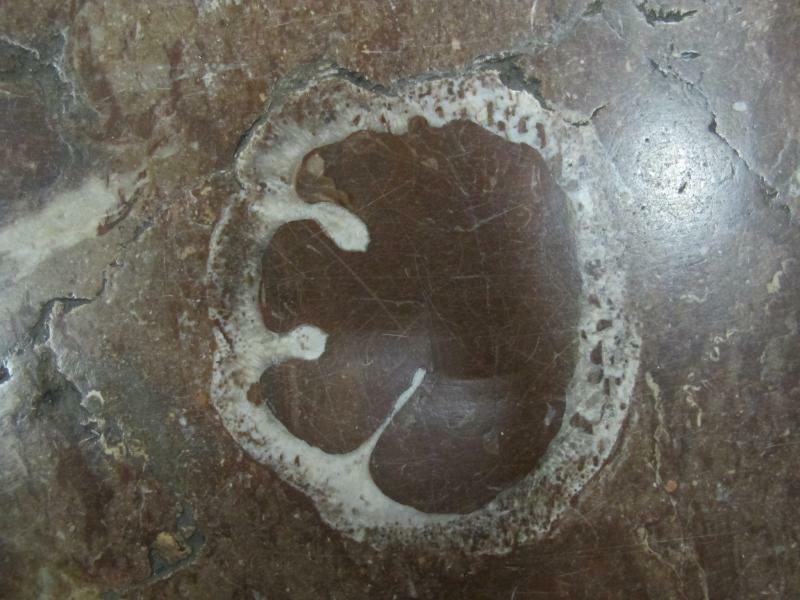 Every carbonate rock, that can be polished, is a marble for the stone industry. But this is very, very old usage, much older then geology as science. Just two different worlds. Like minerals: completely different things to mineralogists and nutritionists. I agree, those are very nice rudists. I can't imagine a mineralogist considering he could eat his minerals for the good effects for his body and saying Something like "Yum, that iron is so tasty". I know a Quarry of morello cherry marble and also qualified morello cherry marble in the geologic file of the Bureau de Recherche Géologique et Minière, which is very fossiliferous whith a huge amount of goniaties and some orthocones. and is very abundant in rudists with the genus Vaccinites, Hippurites and Radiolites. The geological age may be Upper Cretaceous (Maastrichtian). Thank you, i would have liked to bring some back home but when i hammered it, i haven't been able to scratch a millimeter. Probably they are hard as stone, diagenetically transformed, in my thinking.